THE MUPPET SHOW (ITV 1976-1981) made its name off the back of an ensemble of puppets and their vaudevillian antics. With their silver screen debut, THE MUPPET MOVIE’s (James Frawley 1979) gag-filled, fourth-wall breaking opening sequence falls perfectly in line with that legacy in opening with the Muppets gathering in a theatre to watch their own film. Then the actual film starts and tonally, something immediately feels different. 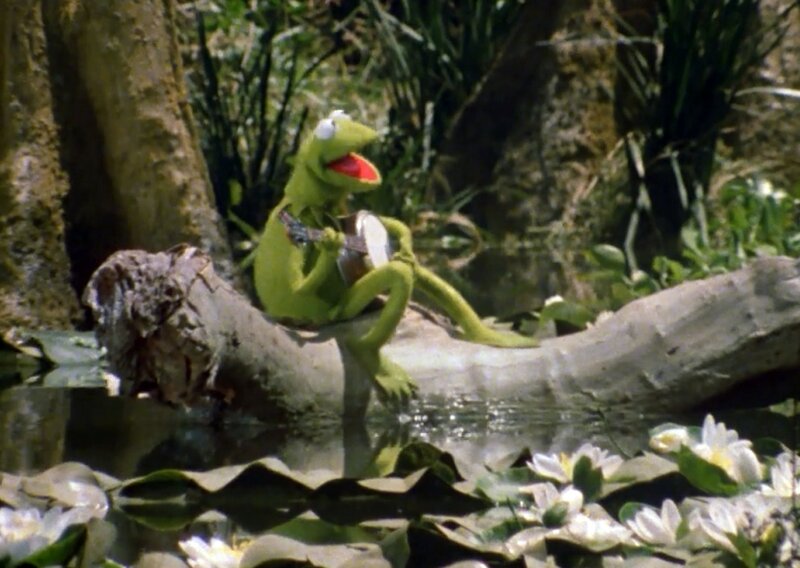 Moving to aerial shots of a forest and the melancholic twangs of a banjo, we swoop down we see Kermit (Jim Henson), alone on a log, singing about his yearning for answers and meaning: “someday we’ll find it, the Rainbow Connection; the lovers, the dreamers, and me…”. ​Henson and company managed to make audiences laugh at a felt frog and his crew for years, but asking them to empathise with the characters is a tall order. The transition is quite the gear shift, and yet it manages to strike a chord with audiences – Kermit’s song "The Rainbow Connection" was nominated for Best Original Song at the Academy Awards, and has been covered by a plethora of artists over the years, from Willie Nelson to Justin Timberlake. Kermit’s bittersweet melody resonates with viewers and representing his longing through song is an inspired touch. Music is a universal language and makes empathising with an amphibian puppet more palatable than if this were attempted through dialogue alone. With the film focusing on a much smaller cast than the television show’s large troupe, characters have room to breathe in a way THE MUPPET SHOW never allows. The likes of Miss Piggy (Frank Oz), Gonzo (Dave Goelz) and Rowlf (Jim Henson) all get their own songs devoted to their dreams and aspirations in a similar vein to "Rainbow Connection". THE MUPPET SHOW certainly has its own share of sentimental sketches and musical performances among the comedy and slapstick, but its characters’ hopes and desires are seldom at the forefront as they are in THE MUPPET MOVIE. It is this change in tone that has allowed the Muppets as a franchise to branch out and tell more emotional stories than before; from THE MUPPETS TAKE MANHATTAN (Frank Oz 1984) and its tale of friends drifting apart, to THE MUPPETS (James Bobin 2011) tackling the Muppets’ bygone place in popular culture. As a franchise the Muppets have been the focus of some genuinely moving films throughout the years, and all of these touching moments and songs can be traced back to Kermit and his banjo at the beginning of THE MUPPET MOVIE. Of course, one would be remiss to pretend the Muppet franchise is at all a serious, dour one. All of the films and shows under the Muppet umbrella are unabashedly silly and THE MUPPET MOVIE is no exception. Between the barrage of meta humour, slapstick and purposefully terrible puns, THE MUPPET MOVIE still unquestionably embodies the spirit of the equally silly MUPPET SHOW. For every "Rainbow Connection" on the soundtrack, there are delightfully absurd numbers like "Movin’ Right Along" or "Can You Picture That?" to balance things out. Yet the comical moments do not clash with the emotional sequences. Rather, they complement one another, the sharp contrast with the comedy making the poignant scenes more impactful. The ability to effortlessly bounce between the two tones, from silly songs to sentimental ones, is arguably the Muppets’ greatest asset, and it is what has made them such an enduring presence through the ever-changing pop culture landscape.